Willie Newsome was born in Dewsbury on the 10th January 1895 and baptised at Ossett Holy Trinity Church on the 17th February 1895. Willie was the elder son of Hemsworth-born wheelwright, John Newsome, and his wife, Ossett-born Hannah (nee Thornton), who married in December 1891. At the time of Willie's birth, the couple were living at Dewsbury Moor, and in 1905 they had a second son, Percy Newsome. A third child was born to the couple, but died before April 1911. In 1901, Willie and his brother, Percy, were living with their parents on Thornhill Road, Dewsbury, but by 1911 they had moved to High Street, Gawthorpe where John Newsome was working as a colliery joiner. Willie, now aged 16, was working as an apprentice furniture polisher. Willie Newsome of 'Holmfield', Gawthorpe enlisted in the Territorials on the 13th January 1915, and joined the 2/5th Reserve West Riding Regiment with service number 5/3755. On the same day he signed Army Form E. 624, also known as the Imperial Service Obligation. Willie was a volunteer soldier enlisting in the Territorials, albeit after the declaration of war. Territorials had the right not to serve overseas during the term of their engagement, but in signing Form E. 264 he waived this right and pledged to serve his country overseas in the event of national emergency. At the time of his enlistment, Willie Newsome was aged 20 years and one month, 5’ 7½” tall, with a 35” chest measurement. Willie was embodied at home from the date of his enlistment until the 28th June 1915, when he transferred to the 1st/5th Battalion of the West Riding Regiment and embarked for France the following day. Willie was appointed unpaid Lance Corporal on the 29th August 1916 and was killed in action on the 20th September 1916. Lance Corporal Willie Newsome was posthumously awarded the British and Victory medals and also the 1914/15 Star in recognition of his service overseas before 31st December 1915. At the time of Willie’s death his parents were still living at “Holmfield”, High Street, Gawthorpe, Ossett. The 1/5th Battalion of the Duke of Wellington's (West Riding Regiment) was formed in August 1914 at Halifax as part of the 2nd West Riding Brigade, West Riding Division. They moved on mobilisation to coastal defences near Hull and Grimsby, then on the 5th November 1914, they moved to billets in Doncaster. On the 14th April 1915, the Battalion landed at Boulogne and on the 15th May 1915, the formation became 147th Brigade in 49th (West Riding) Division. On the 30th January 1918, the Battalion transferred to 186th Brigade in 62nd (2nd West Riding) Division. The Battalion also absorbed the 2/5th West Riding Regiment and was renamed the 5th Battalion. Lance-Corporal Willie Newsome was killed during the The Battle of Flers-Courcelette, 15th - 22nd September 1916, which was the third main phase of the Battle of the Somme. It is best known as the first tank battle in history, as it featured forty-nine Mk I tanks (although not all of the tanks made it into battle). The 1st/5th West Riding Regiment as part of 147 Brigade carried out it's first major offensive at Thiepval on the 17th September 1916. Prior to this the battalion had been 'in support' or 'in reserve'. The 49th Division carried out several raids with varying success, but the casualties sustained were heavy compared with earlier engagements and this is probably where Willie Newsome was killed or wounded. 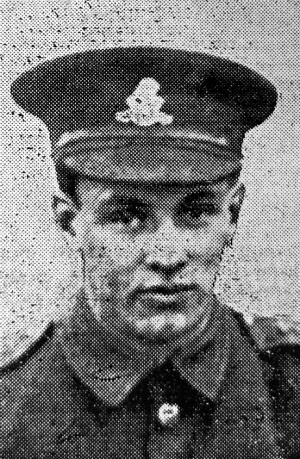 "Gawthorpe Soldier Killed - His Fathers Premonition - Lance-corporal Willie Newsome, whose home is at Holmfield, Gawthorpe, is another Ossett soldier who has given his life for his country. His father, Mr. John Newsome, on Wednesday morning, received an official notice that he had been killed in action on the 20th September. Lance-corporal Newsome who was twenty-one years of age had been in France continuously for fifteen months. Unlike many other soldiers who have been enabled to pay an occasional hurried visit to their relatives and friends, he had never had leave since he crossed to France, and so his parents are mourning the loss of a son whom they have not seen for considerably over a year. The deceased soldier enlisted in January of last year. He was then working in the joiner's shop at Low Laithes Colliery, where his father is employed. He joined the West Riding Regiment, and during his fifteen months in France has seen a good deal of fighting. But his letters home were always 'cheerful as a lark'; the buoyant spirits, which were one of his characteristics, entered into his letters home. 'A bright and winsome lad, fond of sport and enjoying the years of his boyhood to the full, he was a favourite with all he came across.' is how one closely intimate with him described him. He was a choirboy at Gawthorpe and Chickenley Heath Parish Church, and a regular attender at Sunday school there. He was also a member of the Flushdyke football team. Beyond the official notification of the death, no particulars have yet reached his father." 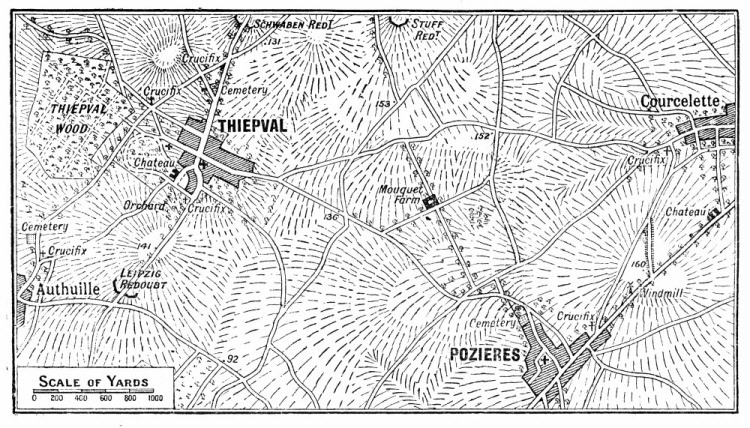 Above: Map of area between Thiepval and Courcelette where Lance-Corporal Willie Newsome lost his life in September 1916. Lance-Corporal Willie Newsome, aged 21 years, son of John and Hannah Newsome, of "Holmfield," High St., Gawthorpe, Ossett, died on the 20th September 1916. He is buried at grave reference V. P. 4. at the Lonsdale Cemetery, Authuille, 1 Somme, France. Authuille is a village 5 kilometres north of the town of Albert on the D151 road to Grandcourt. The Cemetery (signposted in the centre of Authille) is 1 kilometre east of the village.